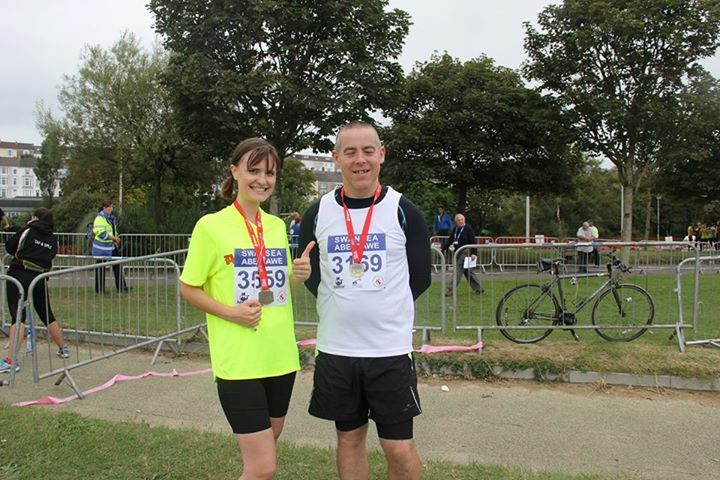 Well the Swansea 10K came and went and we ran it in under an hour. My training buddy Lowri Williams ran it in 59:12 and I was in 59:22 – so happy to have completed that in a reasonable time. How did it go? Well it was humid. I struggled around 8k as we hit a little hill in Blackpill but otherwise it was okay. I miscalculated the clothes I wore and put on a skin top and my charity vest. The Skin stuck to me like glue all the way and was too much for the humidity. There was one water stop which was a nightmare as everyone moved to the right of the path to grab a bottle. The water stop was a bit of a nightmare. I had almost finished my own bottle by the water stop, and was only given a tiny 330ml bottle which was not enough for the next 5K. I ran out 2K before the end and it ruined the race for me, as I wasn’t thinking about the race, I was thinking about how they’d have water at the end!